Many people take restaurant quality ice for granted. If you get a glass of water from pretty much any restaurant you receive perfectly formed and clear ice. This is achieved by very expensive ice machines that cascade water over the ice mold until the ice is formed. Ice formed in layers freezes clear because any impurities in the ice will freeze last and since the water is being cycled through the mold that never happens. Why can’t I do this at Home? Because you don’t have a commercial ice maker at home and consumer ice makers and molds trap the water in the mold which forces you to freeze the impurities which causes cloudy cubes. Ice trays also freeze cubes from the outside in. So the ice on the outside of the cube freezes first this traps water in the middle. 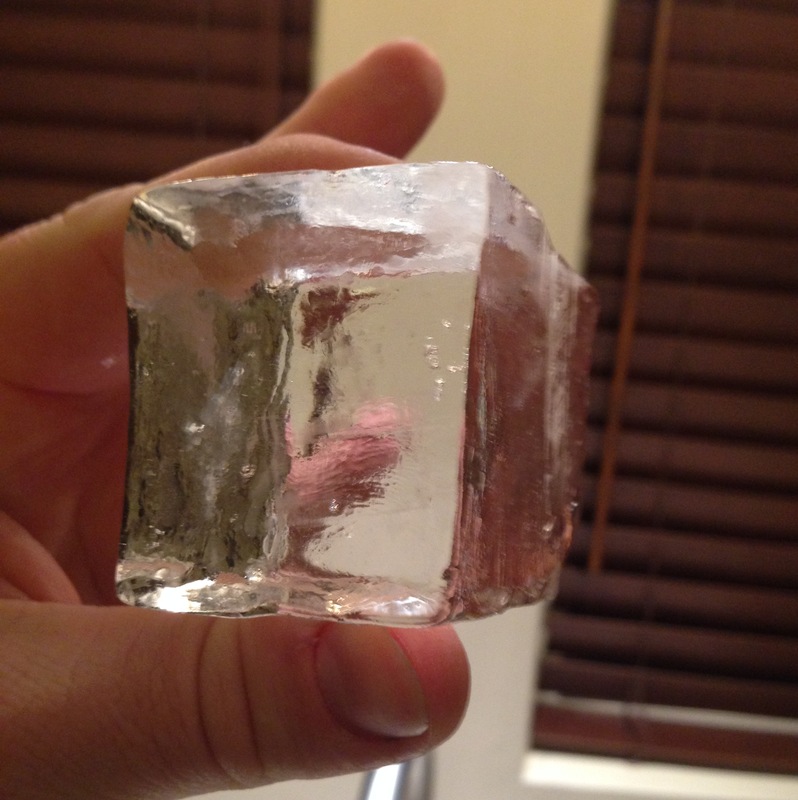 When that water freezes it puts pressure on the cube which caused causes the ice to crack and pop when introduced to liquid. So what we do to compensate for not having a commercial ice cube maker is use the Top Down Method. If you insulate your ice trays on all sides but the top, then the water will freeze from the top down. This will force all the impurities to the bottom leaving a clear top portion. This is what my setup can offer. Clear ice cubes that stay in one piece and melt slowly. If this isn’t what you are looking for or you don’t think these result are impressive then you probably shouldn’t continue reading because this post isn’t for you. There is some effort to build the mold and shape the cubes once they exit the mold so if you don’t want to do the work then you can’t have the rewards. The first thing that you need to do is make the insulation for the ice mold. 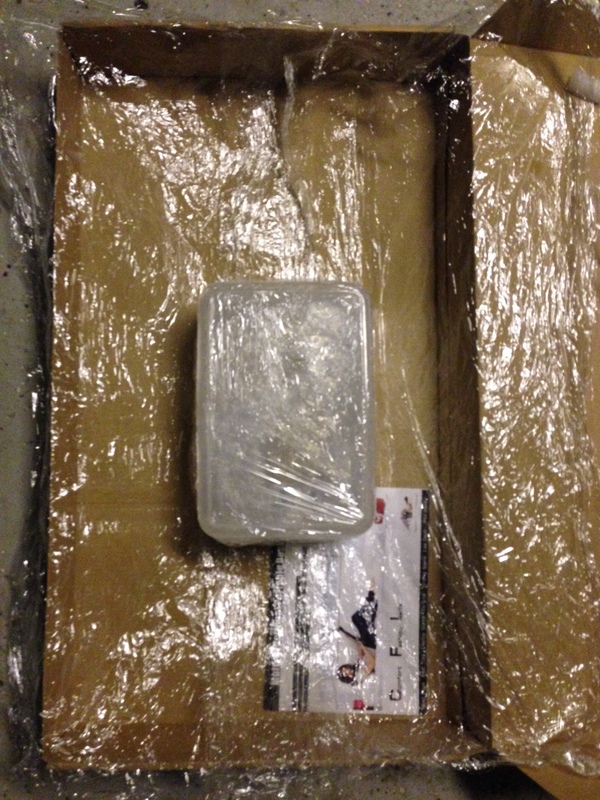 Take your 8 cup deep dish plastic container and wrap it in plastic wrap to protect it from the spray foam insulation. Layout some plastic wrap down to prevent the foam from sticking to the ground. Shake your spray foam as instructed on the can and cover the entire container with spray foam. I go around in a circle around the outside in layers trying not to miss any areas or leave gaps. After about a day it will harden, but you should allow it to harden for at least a few more days because the foam on the inside is still soft and will expand making the plastic container no longer fit. Once it’s cured I use a knife to trim the edges and bottom so it will sit flat and be generally less bulky and more shapely. 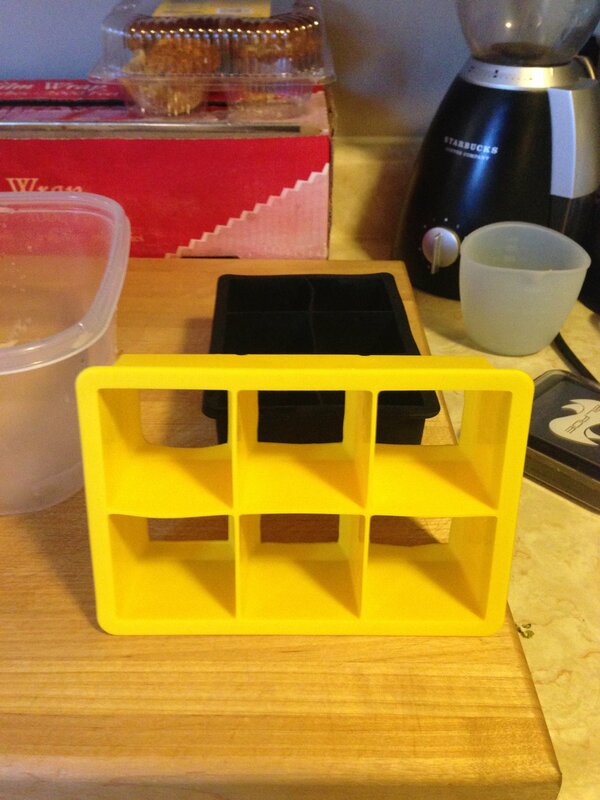 Grab one of your Tovolo Ice trays and cut the bottom out of the molds. When you stack the molds this allows the impurities in the water to pass through the top tray and into the bottom tray. These ice trays taper inward at the bottom and I cut that bit off as well, that way when you stack them you essentially have a long rectangular column. Your final mold will look something like this. Now all you have to do is fill the entire container full of water, all the way to the top, and stick it in the freezer. Once the entire thing is frozen you just have to get your ice out of the mold. 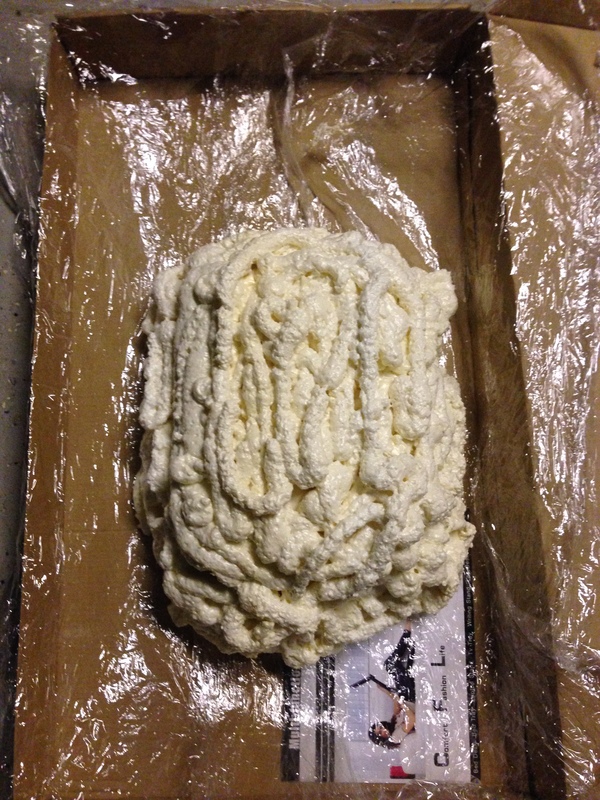 Pull it out of the freezer take the plastic container out of the foam insulation. You can run water over the bottom so the ice will come out of the plastic container or just let it sit for a bit. Once the clump of ice is out of the plastic container I use a metal meat tenderizer to hammer away at the sides and bottom of the molds which isn’t that thick so with a little work and you can free the molds from the surrounding ice. Peal back the bottom mold and then the top mold and you have 6 misshapen rectangular columns. I use an old flat bladed knife to shave and cut the ice down to size ( Please be careful don’t cut your fingers off ). 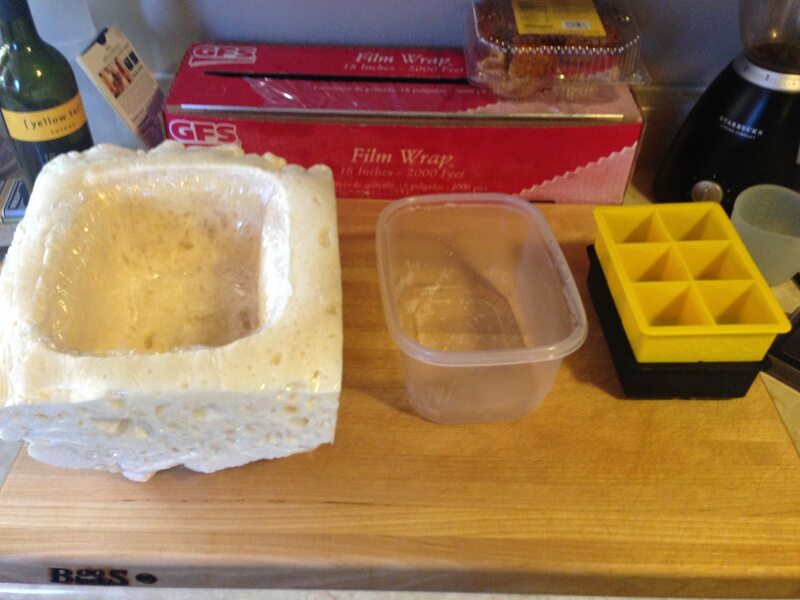 You can have longer cubes or actual square cubes since the mold will make enough clear ice to have longer pieces. There you did it! Too much work? Sounds like a lot but it’s not that difficult really, it’s just a matter of how badly you want perfectly clear ice. 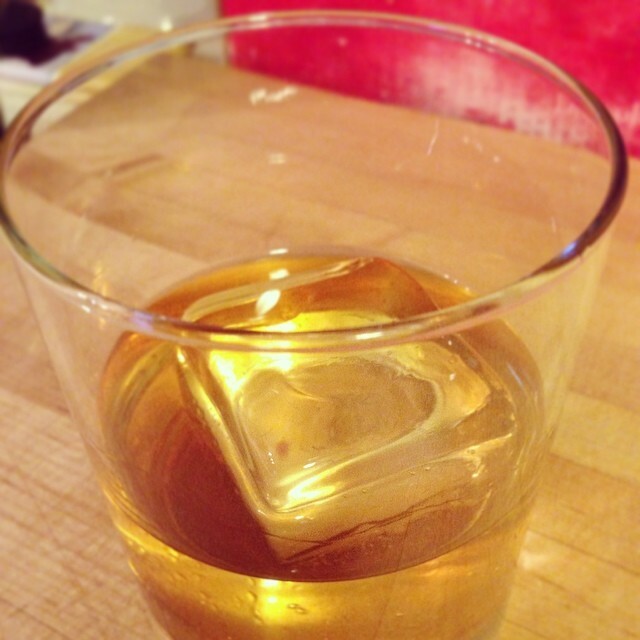 You can use your clear ice cubes for cocktails, hard liquors, or other fancy beverage of choice. Use Distilled Water – Distilled water has no minerals so there won’t be as many clouds in the ice. Boil the water before putting it in the freezer – This gets air out of the water and can make the water freeze slower which is always better. Turn your freezer down – If you freeze the water slower it will be less likely to trap air bubbles and create clouds. When you take your cubes out of the freezer to be used it’s a good idea to let them temper before pouring liquids over them. Sometimes even the warmth from your hands can make them crack so give them a minute to warm up before dumping liquid onto them. All in all it’s about the method and not these tips above. The examples above were made with tap water that wasn’t boiled so you can get good results without the above. This is by far the most thorough article on ice freezing that I’ve read today. Counterintuitively, boiling water (212F) will freeze faster than room temperature water. This phenomenon is known as the Mpemba Effect. I beliveve the Mpemba Effect hasn’t really been proven and only occers in specific situations. Regardless boiling the water helps the process of freezing water top down.